Goals: Length goal – Waist Length (Current length is just below BSL, close to MBL). Declutter and Cleaning 2012, reclaiming healthy eating and continuing my current exercise routine. Finger detangle and pre-poo with coconut oil/Vatika oil 24 hrs, or no less than 30 minutes, prior to wash.
Wash with heavily diluted Lemon Coast Terressentials Hair Wash or Terressentials dupe using Rhassoul Clay (Fri). Modified co-wash with Giovanni 50/50, AOHSR or Tresemmé Naturals (Tues or Wed). Deep condition with body heat or heatcap for 45 min. to 2 hrs- (Giovanni SOS, Aubrey Organics HSR/White Camellia or Jessicurl WDT). Last rinse with cool water. Apply modified Kimmaytube Leave-in-using Giovanni Direct Leave-in or 50/50 Conditioner mixed with Hempseed Oil, AVJ, JBCO and Cocasta Shikakai Oil. Braid hair into 6 braids, sealing ends with KBB Butterlove and allowing hair to air dry. Seal ends nightly with homemade shea butter mix. Search & destroy and trim as needed. Finger detangle, comb and style (use comb for parting only). 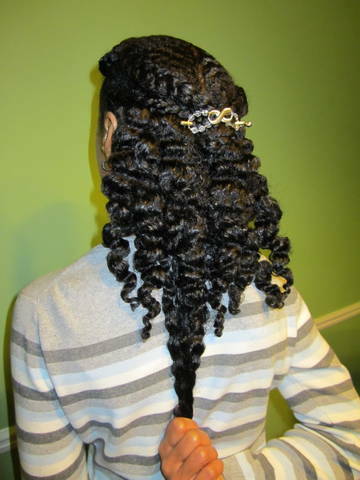 Protective styling: Plan to decrease the number of braids from 8 to 6. Would also like to try new styles, as I am style challenged :(. Would like suggestions regarding co-washing more. Release negative beliefs, toxic people, clutter, junk, etc. Eat more fruits (less sugar free candy). Exercise 6 days per week for 1.5 hrs with additional 2 nights of stepper, zumba or low impact aerobics. Reward: Since this is from 4/12 to 9/12 and my birthday is in October, I will reward myself with something special, however undecided. Possible vacation. Documenting: I do not have a site, however I will keep a journal and record regularly. Your hair is beautiful. Good luck on the hair and spring cleaning challenge. i agree with katina. your hair is beautiful. so shiny…im a fan of shine lol. I was thinking just what the other ladies are thinking. Your hair has to be the most beautiful I’ve seen to date. Boy, I think you’re my new hair crush!!! Gorgeous healthy hair! I think you should re-think your reward, a reward for the challenge and still a gift to yourself for your bday, why limit the self-giving?? Good luck in your goals! Love your hair!!! Very Beautiful!! !